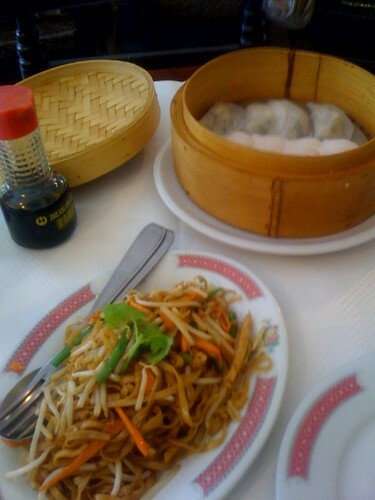 You’ll find a small collection of Asian restaurants between the Opera and the Tuilleries. Centered around rue Sainte-Anne , the neighborhood has become a magnet for Asian tourists. You’ll find pho, sushi , noodles, and soup restaurants that range from the quick and cheap to trendy and bustling. In the center is a small Japanese miso soup restaurant that I’ve been finding myself eating at more and more. It’s a simple place with an open kitchen, large pots of boiling miso broth, and a friendly, bustling atmosphere. This is a simple place that may remind you more of a roadside diner than a French bistro. Miso soup normally brings to mind a small bowl of broth with a few small chunks of tofu floating amongst green herbs. I was greatly surprised when I ordered the vegetarian soup bowl and was presented with a Texas sized spoon and a big bowl of broth with fresh vegetables and noodles. This is a meal by itself, you won’t need any rice or dumplings. Paris is a great place to have a big lunch with friends and a simple dinner of soup or salad. I’ve added this place to my list of regular stops. It’s especially nice on a cold rainy night when the windows fog up and you are surrounded by the smell of the broth. The No Stress Cafe received international attention for combining fortune telling, massages, and food in a simple Paris cafe. It sits down the hill from the sin-soaked Pigalle area facing a pleasant terrasse fronted by restaurants. The cafe has matured over the years. The massage chairs have been replaced with more dining tables and an increased attention towards dining instead of dozing. However you can still get your fortune told and enjoy a no stress dinner. I’ve mentioned my favorite chef in Paris, Jacques. What I may not have mentioned enough was his partner and sous chef Dean. The two of them created a menu that kept the No Stress Cafe from becoming a one line joke, “hey did you hear about the cafe with back rubs near Pigalle…”. Jacques has moved on to other restaurants and Dean is now the chef of the No Stress Cafe. I can tell you from experience that Dean is a masterful chef. He has an international approach from his Asian heritage and years of cooking in Paris. His menu at No Stress is a fusion of Mediterranean, French, and Asian recipes. The standard menu features several vegetarian and vegan options. However, you can also request the Tapas menu to be vegetarian. This is what I had the other night and it was excellent! Dean gave me a bit extra but you can expect an assortment of tempura, pickled vegetables, lasagna, and other seasonal vegetables. Dean also makes a killer bowl of vegetarian french onion soup. He uses white wine instead of stock and it blows away the french onion soup at Potager du Marais. It’s not on the menu, but he’ll make it the soup of the day if you make your reservation a few days in advance. Tell them Ted sent you. Eating at No Stress cafe reminded me of sharing a dinner at chez Jacques and Dean. Ample portions of food from around the globe served family style with great affection. Crêpes filled with cheese, crêpes filled with ham, crêpes filled with potatoes drenched in a cream sauce, crêpes, crêpes, crêpes. This is what I expected to see in Rennes. 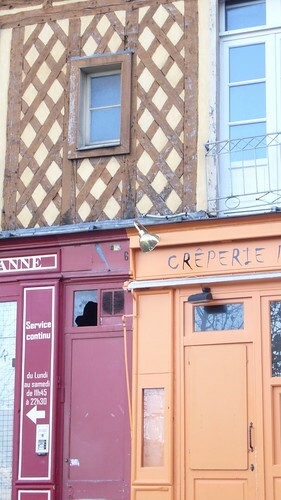 And while there were certainly crêperies on every street; the city also features a wide variety of ethnic restaurants. You’ll find Indian, American, and luckily a Tibetan restaurant in the city center. Restaurant Tibetain Dolma provided one of the best dining experiences I’ve had in a long time. It’s a small, intimate restaurant filled with charm… and that includes the people. The menu is a cross between Asian and Indian food; the flavors of India with the preparation of China. I found the restaurant after walking around the city for hours and needed a place to plop down and eat something warm. I hardly got a chance to plop as the service was so warm and the food so interesting. I started with a large pot of Chai tea. This is the real stuff, not the frappe-sweet version from Starbucks. It’s spicy, hot, and not too sweet. It was the second best chai I’ve ever had. The first was in the lunchroom of Yahoo! in Bangalore. The third was in a tea shop behind Pikes Place in Seattle. The entree sounded like a curry. The menu described it as potatoes and peas in a curry flavor. What arrived were two racquetball sized, fried dumplings filled with potatoes and peas and seasoned with curry and other spices. On the side was a home made chutney. Watch the chutney, there are some hard spices that could break a tooth. They look like raisins but are more like solid pepper seeds. Just don’t chomp down on them. This was followed by two steamer baskets of spinach and cheese dumplings with another custom pepper sauce. The dumplings were great and quite filling. The waitress probably guessed I was American and thought I’d enjoy some chili sauce. After asking, she brought over some thicker pepper sauce. While I like the heat, the first one was more complex and tasted better with the dumplings. The final course was home made yogurt with honey. This was the perfect finish to a fairly light lunch in a city filled with heavy crêpes. I planned on returning the next day but got sidetracked by a trip to Mont St. Michel. Which was definately a good idea. Don’t miss this restaurant when you travel to Rennes. You’ll find warm service, great food, and a memorable meal. How to Add Asian Flare to Your Cooking? This popular chinese food has your traditional Chinese vegetarian dishes as well as an assortment of creative “faux” meat choices. It’s a popular destination for vegetarian tourists and is located near four metro stops. Pere Lechaise and Voltaire are the easiest. I had been planning a trip to Tien Hiang to try their food and imagine my surprise one night when I walked past it on a warm evening stroll. Although I wasn’t hungry, I had to stop off for a meal. This restaurant is great fun for small groups and the menu is a smörgåsbord of vegetarian Asian food. While this restaurant is listed as Chinese in many guides, their menu is sprinkled with dishes from across the Asian spectrum. Vegetarians are used to deciding between one or two dishes on a menu. It’s difficult to actually choose between 50-60 dishes. Prepare yourself for ten minutes of indecision. Tien Hiang has a good fixed menu to make that choice easier. You simply choose two appetizers, dinner, and desert from a smaller set of dishes. The menu prices are outrageously affordable. 10 euros gets a full meal! The soup was fantastic. It had coconut milk, pepper, tomato, fake chicken, and basil. It was a great mix and I’ll probably come here more often for just a bowl of soup. The omelet was good, but I was satiated after the soup and earlier meal. So, I wasn’t prepared to really evaluate the dish. Tien Hiang is a small, popular restaurant. The place was packed with a wide range of alternatives, hipsters, families, and hippies (faux hippies). In other words, it’s a casual, come as you are restaurant. However, it’s also a small place and it gets warm with all of the bodies. I can only imagine what it will be like during the late summer months. I really enjoyed this restaurant. The menu is expansive and you’ll probably find yourself wanting to come back and try something else. The dishes range from Pho, clay pot, steamed dumplings, fried rice, and much more. You’ll find vegetarian versions of the most popular Asian dishes. The prices are super cheap, the service friendly, and the community unique. It’s not the easiest place to find, take a map with you. Unless you’re lucky like me and stumble across it accidentally.